We are delighted to confirm the signing this morning of 20 year old Irish midfielder Joel Coustrain on a one year deal. 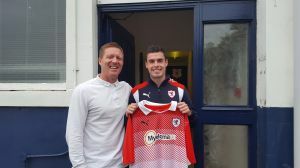 Joel has impressed manager Gary Locke in pre season friendlies, and he may feature in this evening’s Betfred Cup match against Cove Rangers at Forfar, subject to international clearance being obtained. Joel has represented Republic of Ireland at various youth levels up to Under 19’s and he has bagged 5 international goals. He was previously on the books of Sheffield United, and gaffer Locke swooped to sign the talented youngster following his release from the Blades a couple of weeks ago.